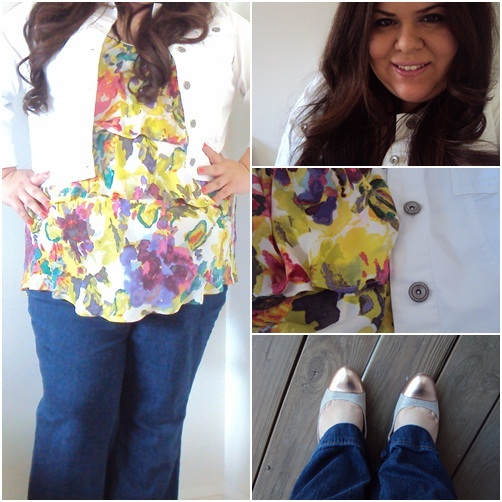 Babblings of a Mommy: Spring Style Trends: Bright White. Spring Style Trends: Bright White. Now that Spring is here, it’s time to replace our heavy winter wear with bright prints and lighter hues. White has always been a fashion favorite, so it’s no surprise that it was all over the runway for spring/summer 2012 too. Always crisp and cool, this trend is the perfect way to transition into your spring wardrobe. I like to use it as a layering piece such as a blazer or jacket, like this cropped one from Sonoma. Then for a pop of color I paired it with a Daisy Fuentes floral tiered top, dark denim jeans, and super cute (and comfortable) Jennifer Lopez toe cap flats, all from Kohl’s! By now you should know that Kohl’s is one of my favorite go-to places to find hot trends, and fabulous brands at affordable prices. In fact, everything here cost under $100!! What a steal, right?! There’s nothing like starting a new season with some savings in the bank! Visit the Kohl’s Style File to learn more about the hottest trends for this Spring and Summer! That floral print is just lovely! I love Kohl's. What great pieces! I like the white blazer idea. I might have a hope of keeping it clean! SO CUTE! I love the floral top with the denim and the white. Gorgeous! !